Which of the following authors would you most want to meet? You are: Elizabeth I, Queen of England, 1533-1603. With a childhood full of political intrigue, it was assumed that Elizabeth would never become queen. But she did, and as queen managed for a time to quiet her Catholic population with acts of tolerance, promote government reforms, strengthen the currency, and forward the growth of a capitalist economy. Highly educated, she also turned her court into a great center of learning. Elizabeth's foreign relations were uneasy. Always pressured to marry to form political alliances, she diplomatically seemed to consider it, but in the end always refused. Her greatest success was the defeat of the invading Spanish Armada in 1588 in the waters off England's west coast. Her greatest failures were the suppression of uprisings in Ireland and her long wars. During Elizabeth's colorful 45 year reign, England became a strong European power, a vibrant commercial force, and an place of intellectual accomplishment. The "Elizabethan age" rightly was one of England's most fascinating eras. This was sort of fun. I did this while I was bored and couldn't sleep. 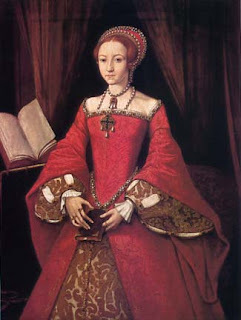 I think it's really neat that I turned out to be Elizabeth I. I haven't gotten around to reading a whole bunch of fiction about her yet because I want to get through as much about her father and mother/stepmothers as I can. I do look forward to reading more about her though. I would love to see what everyone else turns out to be! So I'll close this post with a link. Leave me your results in my comments! 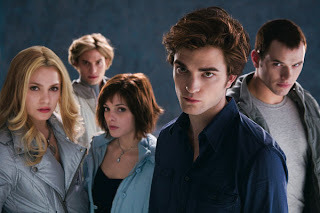 So I know it's not a book review... but since I am such an enormous Twi-Hard, I feel it necessary to pass on the word about the movie version of Twilight to all of those doubters out there. Let me put it simply. Do you like the book? If yes, you will love the movie. I personally know that Robert Pattinson will haunt my dreams for a while after seeing his intense Edward stares. He was even better than I thought he would be. The entire cast was chosen perfectly. I cannot wait for them to film the rest of the books. In all seriousness, it really was wonderful. More than likely, I will see it again in the theatre just to catch things that I may have missed the first time around. I did that with the last Harry Potter movie and was very happy about it. So please, go see the movie. Get over the hype, because this movie really did live up to it. I promise. And if you are living under a rock and haven't read these books yet, do it. No joke. You'll finish them in no time at all. They're all quick reads and are wonderful reads. On another note, the previews to Twilight were also something to be wondered at. A new trailer for the sixth Harry Potter movie was shown. It looks even better than I had previously thought. I hope I never grow out of loving these things. I may be 23, but I guess I'm a 14 year old little girl at heart. This is Donna Jo Napoli's Beast. 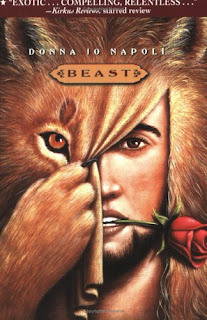 It is the story of Beauty and the Beast, but tells the story about what happened to the beast and how he got to where he did. Prince Orasmyn is in line to be the king of Persia when he angers a fairy. The fairy then condemns him to a life as a beast. Her curse will only be broken when a woman falls in love with him. Orasmyn, trapped in his lion's body, travels to India and tries to assimilate himself into lion culture. But his human instints are too great. He travels to France and finds an abandoned castle. When a man wanders into his castle during a storm, Orasmyn demands that he bring his daughter to him. The daughter who loves roses as much as Orasmyn did. Belle arrives, and the two slowly become friends and eventually fall in love, thus breaking the curse and returning Orasmyn to his handsome human form. I loved this. It's the traditional fairy tale with a really raw and interesting twist. It is a book designed for young adults, but as an adult, I loved it too. It took a while to get into it as it explains in detail a traditional Persian ceremony. However, after this, the story really picks up. It is interesting to get a look into the trials that Orasmyn had to face. We all know what Belle went through thanks to Disney, but we never knew what made the Beast so bitter and resentful. This book sheds Napoli's interpretation on this. I'd recommend it if you're looking for something a little bit different. If you liked Wicked, you'll like this better. The language is easy to follow, and the entertainment level is there too. My reading has been a bit sparse this month. My first semester of my teaching program is coming to an end, and of course everything is due now. But I am planning to start I Am Mary Tudor this week if I get the chance. I've heard good things about it, and it's about the Tudors... so I can't really go wrong there. I am currently looking for reading recommendations. I have not updated my TBR list in a really long time. I am open to pretty much everything fiction. Thanks ahead of time! On another note, I know I will be the envy of every big reader out there when I announce this. I got a part-time job at my local library! I work predominantly in the youth department, which is really fun. Already I had a little girl, who wasn't any older than two, following me around and wanting to copy everything I was doing while reshelving. So adorable. So when I am not at home reading or doing work to teach my future students about reading, I am surrounded by books at work. Heaven for a book nerd like me! Happy reading! As you all know, I adore anything Tudor. I especially love learning about all of Henry VIII's wives. I've a couple Catherine of Aragon books, tons of Anne Boleyn, and one about Jane Seymour. 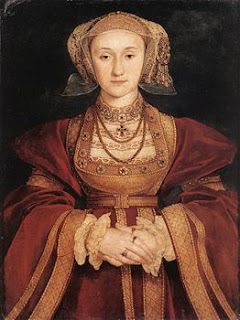 My Lady of Cleves, by Margaret Campbell Barnes, is the first book that I've read about his fourth wife, Anne of Cleves. I haven't found a lot of fiction about her. I actually quite liked this book, and in turn like her. She is quite possibly the only wife of Henry's that was able to keep a content lifestyle once he no longer wanted her for a wife. You also get to stay with Anne while she observes Henry's fifth and sixth marriages to Katherine Howard, followed by Katherine Parr (he had a thing for Katherines, didn't he?) If you like Tudor fiction and are curious about wives other than his first two, grab this book. It's a little bit older, but the quality is still there. I recently got a part-time job to help pay for my schooling at my local library (dream come true!!). While I was there, I picked up two Jean Plaidy books, one about Katherine Howard and one about Katherine Parr. So by the end of 2008, I'll have read at least one book about each of Henry's wives. Hurray! On a completely different note, this is to anyone who has not read the Twilight series. You need to read these books. I know they're young adult, and I know that they are ridiculously popular and remind you of the Harry Potter mania (which I miss terribly). But they really are wonderful books. They're great fora young adult and for an older adult. I'm 23 and could not put them down to so much as eat. It pained me when I had to put my book mark in them and get back to doing work. You'll love them. And you'll finish the first one easily within 24 hours, I did. And if you act now, you'll even get the first book, Twilight, read before the movie comes out on November 21. You'll be able to find me at the theatre at midnight with all of the 14 year olds. So there's my two cents about Twilight.